A p-n junction is a single semiconductor crystal that has been selectively doped so that one region is n-type material and the adjacent region is p-type material. 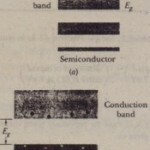 Such junctions are at the heart of essentially all semiconductor devices. 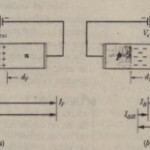 We assume, for simplicity, that the junction has been formed mechanically, by jamming together a bar of n-type semiconductor and a bar of p-type semiconductor. Thus, the transition from one region to the other is perfectly sharp, occurring at a single junction plane.Let us discuss the motions of electrons and holes just after the n-type bar and the p-type bar, both electrically neutral, have been jammed together to form the junction. We first examine the majority carriers, which are electrons in the n-type material and holes in the p-type material. If you burst a helium-filled balloon. helium atoms will diffuse (spread) outward into the surrounding air. This happens because there are very few helium atoms in normal air. In more formal language, there is a helium density gradient at the balloon-air interface (the number density of helium atoms varies across the interface); the heliumatoms move so as to reduce the gradient. In the same way. electrons on the n side of that are close to the junction plane tend to diffuse across it (from right to left in the figure) and into the side. where there are very few free electrons. Similarly, holes on the p side that are close to the junction plane tend to diffuse across that plane (from left to right) and into then side, where there are very few holes. The motions of both the electrons and the holes contribute to a diffusion current Jeff, conventionally directed from left to right as indicated in .